Wonderful Jacqui! I’m really looking forward to this week and reading all the posts. I’ll be putting up my post – also on After Leaving Mr MacKenzie, and Good Morning Midnight – in a few moments. I was definitely on the sympathy side for Julia, I thought she was in an awful position & you’ve really captured how Rhys’ imagery drives that home. You’re very welcome, Madame bibi. Thanks for writing about After Leaving Mr Mackenzie and GMM, another great post (I do enjoy your two-for-one pieces). Yes, it was interesting to hear a range of different views about Julia in the discussion with my book group. While some people saw her as a faded beauty with her best years behind her, others pictured her as a very attractive woman (hence her appeal to men). Those who felt little sympathy for her predicament thought she came across as someone with a strong (and somewhat misplaced) sense of entitlement to support from her family (and possibly from her former lovers too). Everyone had something slightly different to say about her. Fascinating stuff! I’ll probably make a comparison between Good Morning, Midnight and Smile, Please some time this week (no promises as to when exactly), but I’m really looking forward to reading what everyone else is reviewing and thinking. Thank you and Eric for organising this for one of my favourite writers. You’re most welcome, Marina. Lovely – I shall look forward to that! I was hoping to join in, but alas, didn’t get organised in time. 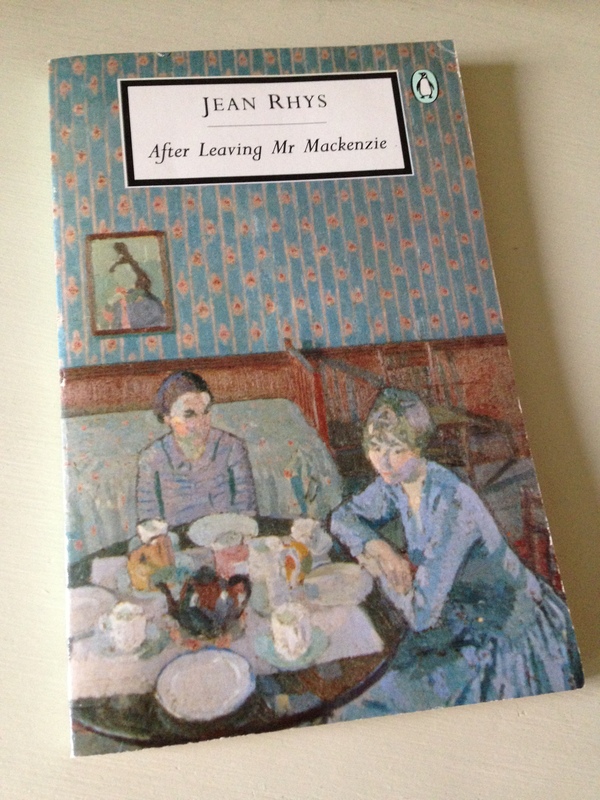 However, I’m really looking forward to reading all the reviews this week, and have already had to add a few Jean Rhys titles (‘After Leaving Mr Mackensie’ being one of them) to my wish list! Ah, no worries. Glad to hear you’ve added some Rhys to your wishlist. Mr Mackenzie is excellent – a good intro to her early novels, I think. Rereading a book a fairly short time after the first read can bring to light so many new things. Time permitting, what you did with After Leaving Mr Mackenzie is a really good thing to do. Rhy’s sounds like a great writer, I look forward to upcoming posts. Thanks, Brian. It’s a rewarding thing to do, revisiting a favourite novel. I noticed so many ‘new’ aspects of the book this time around. The fact that I’ve been reading her short stories helped too, I think. Several themes recur throughout her work. She is an amazing writer – I hope you get a chance to read her one day. How does the banner thing work? It turns out I’ve already reviewed Good Morning, Midnight; Quartet; After Leaving Mr Mackenzie; and a short story collection. I’ll tweet links to them over the week. I’m also posting my review this week of her Voyage in the Dark (though I do need to write it first). Looking forward to your short story collection review. If you click on the picture, you should be able to save a copy. Or I can email it to you if that’s easier? Yes, I know! I shall have to point people in your direction. I’m looking forward to your review of Voyage. It’s the one that really blew me away, although I’ve yet to read GMM which I suspect may well turn out to be even better. I’ll be posting two pieces about her short stories, both connected to the stories published in Tigers (although the second post will focus on the early pieces first published in The Left Bank). Thank you! 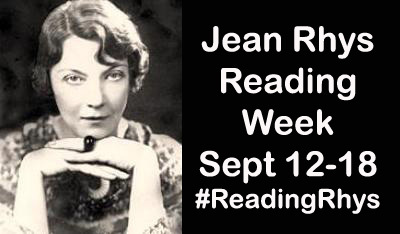 Well, we’re hoping the event will encourage more people to read or revisit Jean Rhys, not just this week but during the weeks and months ahead too. I’m looking forward to hearing all about your return to her work as and when your post goes live – you’re reading Wide Sargasso Sea if I remember rightly? I am indeed and if not live on Wednesday it will be Friday! My head isn’t in the right place for reading Jean Rhys at the moment, but it’s lovely to see such care going into a celebration of her work and so many people reading her work. Sounds wonderful! You’ve done such a lot of work for this, I’m going to really enjoy reading all that comes out of it! Thanks! We’ve put quite a lot of work into arranging things so I’m hoping the week will be a success. That’s great news about Wide Sargasso Sea – and I’m delighted to hear you enjoyed it. Phew! Even if you don’t get a chance to write about it this week, you can always post a piece at any time – I will always be interested to hear more about your response to Rhys’ work. Many thanks for joining in, Naomi! I’m a bit embarrassed to admit Rhys is a new name to me, but I’m looking forward to rectifying that with this week’s posts! I don’t have the right sort of blog to join in, but will definitely be reading with interest! This is going to be a great week! I’m new to Rhys too having just read Wide Sargasso Sea, but I’m looking forward to reading more about her work. I will Jacqui. Finished it last week in preparation! Brilliant – I’m looking forward to reading your review! No worries. I know you’re in the midst of reading quite a few of the titles on the Booker list. She was a truly great writer, so I hope you find something that catches your interest during the week – some ideas for the future, perhaps. Fantastic, that would be great – looking forward to hearing what you think of them! Thank you so much for organizing this event. I enjoyed reading both of your reviews of After Leaving Mr. Mackenzie. I’ll add it to my “must read” list. I look forward to binge-reading everyone’s reviews after I get my own written up. I did read both Good Morning, Midnight and Wide Sargasso Sea. I cannot say Rhys is one of my favorite authors. In face, I really did not enjoy GMM. Fortunately I found Wide Sargasso Sea much more to my liking. I will post reviews, just not sure when! :) Thank you for motivating me to read and learn about an author new to me! I wanted to particptae but I managed to get the flu in spite of the heat wave here. I loved the quotes. She’s such a great writer. And a wonderful stlye. It looks like you had a great programme. Oh no, how rotten for you. I really hope you’re feeling better now? So glad you enjoyed the quotes. She is such an eminently quotable writer, sometimes it’s hard to know when to stop!